09.00 a.m. to 09.00 p.m.
A detailed and enjoyable tour of our beautiful city, Cagliari. 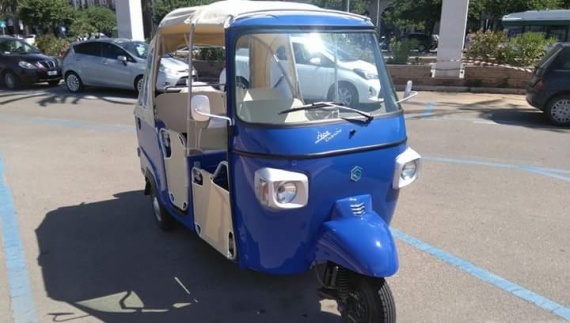 Discover our ancient city with Luigi and his blue Ape Piaggio. We offer you the best way to visit the historical centre, the best panoramic points, our beautiful beaches and all the professionalism that you need. The historical centre of Cagliari is all made by narrow streets, our vehicle is perfect for visiting these streets! Luigi will even bring you to the beautiful Poetto beach (stunning 10 Km long beach) where you will be able to see the Molentargius Flamingos natural park or to drink a refreshing drink in front of the beautiful sea. Professionalism and safety are our key words. What are you waiting for? Cagliari is ready to be discovered!